I love the Coen brothers. I adore the Coen brothers, they make awesome movies. Fargo? The Big Lebowski? No Country for Old Men? O' Brother Where Art Thou? And many, many more. They have a ridiculous track record of off-kilter classics. So when I saw there was a Coen Brothers movie on Netflix I hadn't seen yet I almost started drooling. The Hudsucker Proxy (click here to add to your queue) sure didn't disappoint. I can't believe I missed this movie. 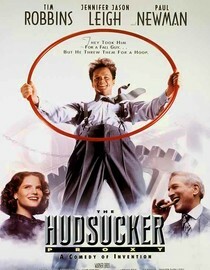 It was a hilarious screwball look at the corporate world with so many hilarious twists and turns. If you missed this one too you should definitely check it out. The story centers around Tim Robbins character who works in the mail room and is promoted to president of the company in order to bring stock prices down so the company can be bought on the cheap. It's a brilliant corporate satire and one of my new favorite movies. 5 Stars! Oh, and make sure you hurry, it's only streaming until December 1st! Why is it in your queue? Coen Brothers! Best thing about the movie? O (you'll understand when you watch it). What mood should I be in to watch this movie? Ready to laugh. What rating did you give it on Netflix? 5 stars!